Play Dates are a wonderful way to experience this lovely breed in a relaxed environment, to ask questions about our adoption or volunteer opportunities, or to just get to know some other Iggy lovers and their hounds! Play Dates are held outdoors in a volunteer's securely fenced back yard during cooler months-typically Spring and Fall. 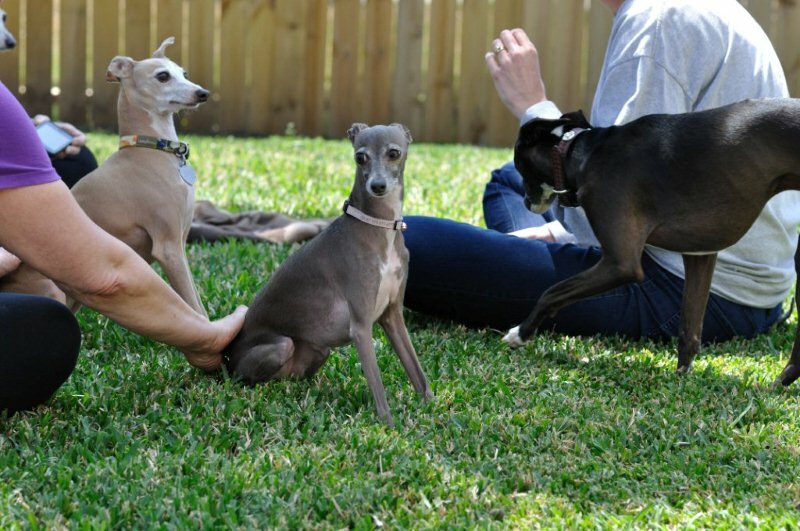 FOR SAFETY'S SAKE-These events are ITALIAN GREYHOUND ONLY unless you have an IG mix that was adopted through IGCA Rescue. All IGs in attendance must be well behaved, up to date on vaccines, and have reached their full adult size-NO growing puppies please. COME ON OUT AND JOIN US! Any currently scheduled Play Dates are listed on our calendar and details about location and contact information are obtained by receiving an Evite for each get-together. If you would like to be added to our Evite list please let us know by emailing the coordinator for your area.